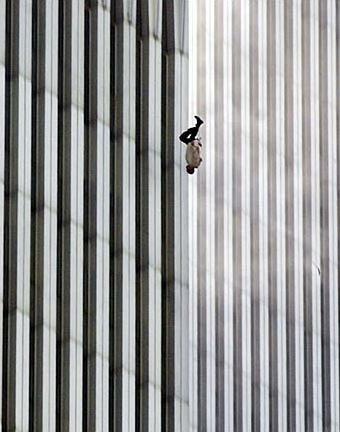 This iconic photo by Richard Drew of the Associated Press captured an unidentified man falling from the North Tower of the World Trade Center on the morning of 9/11. It is estimated that at least 200 people followed suit that day. Even for those who did not witness the event, the image is seared in the mind. That morning as I was walking away from the WTC area on Water Street, there was a woman in near hysterics. She had actually saw these falling people. The terror in her eyes remained with me when I saw the this photo published in the New York Times. The image raises so many questions. “Falling Man” by Don DeLillo, is part aftermath, part performance art. The latter is a man who unexpectedly turns up in New York City in a reenactment of a man falling from heights as onlookers watch believing he will die. Unseen until the act is done, he is tethered inelastically. He incurs bodily damage by doing so, but he is not in search of notoriety. His personal history is unknown. The principal is Keith, an employee who worked in the WTC and survived. He goes to his estranged wife Lianne and his son Keith immediately after leaving the scene. Life, mortality and God are looked at from different viewpoints. Keith is not resurrected. He revels in his isolation, becoming a semi-professional itinerant poker player. Lianne half-heartedly believes in maintaining the family even in an atomic state. Her mother, Nina, a moral hypocrite, never believed in Keith and warns against him. Justin, still in elementary school, with his peers detach from adults and search the skies. The perspectives of the terrorists are also considered. “But the system doesn’t justify this. Islam renounces this,” he said. Lianne looks at pictures of old passports framed on Nina’s wall. Her married boyfriend, an art dealer, gave them to her. Lianne, first flails against her arab neighbor. Subsequently she seeks out a mosque. Don DeLillo is one of America’s best authors, but this is the first novel by him that I have read. A new novel by him will be released this May. He is an interesting writer and this is an a good book that realistically describes 9/11 and the period thereafter. I had been looking forward to read Alejandro Zambra. He is appreciated by his Latin American peers who have created a beachhead in the U.S. market. I heard a few of them at the Brooklyn Book Fair last Fall. Unlike Valeria Luiselli, whose novel I recently reviewed, Mr. Zambra’s command of English is fairly weak, so “Ways of Going Home” is translated by Megan McDowell. These young novelists are trying to convince U.S. publishers that magic realism is not what is written nor read by most authors and readers in Latin and South America. What I have noticed about this cadre of writers is that their works often contain references to works by their peers. The few works by them that I have read are also partly autobiographical. This is the case with “Ways of Going Home”. It is a novel about relationships during and after the Pinochet regime in Chile. The principal relationship is between the narrator, an unnamed boy of 9, and Claudia, a 12-year-old neighbor. She has him spy on her uncle Raul but does not tell him why. The boy remains infatuated with her and when they are adults their relationship is reignited. The boy, now an adult novelist, also tries to rekindle his relationship with his ex-wife and muse, Eme. The back drop of the novel, is the impact that the Dirty War years had on familiar relationships. Although the author claims the novel is not a love story, its stronger elements are his insights about relationships. His better known novel is “Bonsai”, which earned him the best novel Chilean Critics Award. Part of “Ways of Going Home” had appeared in Granta. I found this surprising as it is a novella in size. The book was published by Farrar, Straus and Giroux, a very reputable publisher. Given this, I was surprised to find an editorial error. Dialogue is repeated nearly verbatim on pages 64 and 109. It is not stylistic. Although Mr. Zambra is a capable writer, I felt that he was going through the motions in writing this novella. It is not a bad novel, but I felt that he was turning out a product to please his publisher. It is a decent quick read, but I think he should demand more from himself. Two young boys from Protestant England are deposited on scholarship at a mostly day Catholic school in Bradcaster on the eve of World Water II. Roper, irreverent in his search for a unified theory of creation, is matched by the socially mature Hillier, in a challenge of Catholic orthodoxy at the school. The first chapter of Anthony Burgess’, parody of spy novels, is unfortunately the best. Roper, to the displeasure of Father Beauchamp, challenges God and breaks down the Eucharist into its molecular structure. Unfortunately the War intervenes. Hillier making use of his Slavonic language skills joins her Majesty’s intelligence service. Roper is sent off to Germany to fight and develops an affinity for all things teutonic. Reflecting Russian infiltration of England’s spy network, Hillier ultimately defects to Russia during the Cold War. It is up to Hillier, in his last assignment before retirement, to return Roper to England. The parody is more of Ian Fleming spy novels, then of Le Carre. Written in 1966, the novel feels a bit dated. As one reviewer noted, in writing a satire, Burgess wrote a mediocre spy novel. After the first chapter the humor is flat, and as a satire, there is no suspense. Read the first chapter for a laugh, then find another book to read.